All New Jio Plan, Jio Updated Plan, Jio 399 Plan Validity, Jio New Best Offers, Jio Best Offers, Jio 3 month plan price, Jio Increased Plan Rate – Hello Tricks Store readers, Hope you all the well and enjoying our free recharge offers. Here is bad news for Jio users because Jio Brings New Increased Priced Plans in this Diwali. All the new jio plans has been active from 19th October 2017. Recharge today for new updated Benefits. Here is a very important new for all the Jio users who are planning to recharge or wants to update it’s jio plan. Reliance Jio changed all Prepaid plans from 19th October 2017. 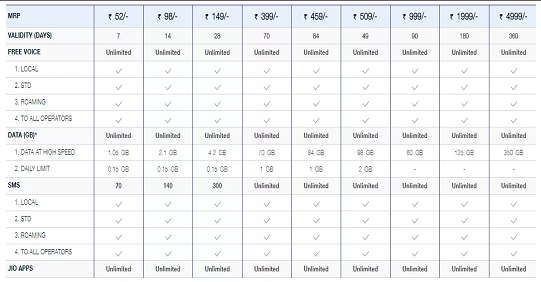 All though Jio decreased it all plan’s validity but price is almost same as previous plan, As example in jio 399 plan old plan validly was for 84 days but now jio is giving it for 70 days. For more just check the plan details here. If you have not recharged yet , just go for new updated jio plan. If you want cashback on jio recharge we already made post regading some of the best jio cashback recharge offer, just choose one of them and do it recharge now.